If there is one thing that’s certain in today’s election, it is that the Republicans will take over the House of Representatives. The media, professional prognosticators and poll-driven forecasters all seem clear on this point. But what about the people actually donating money to the candidates? Do they see a Republican takeover of the House as a foregone conclusion? As it turns out, probably not. The bottom line: The model favors Democrats' retaining their majority with a loss of between 19 to 40 seats. 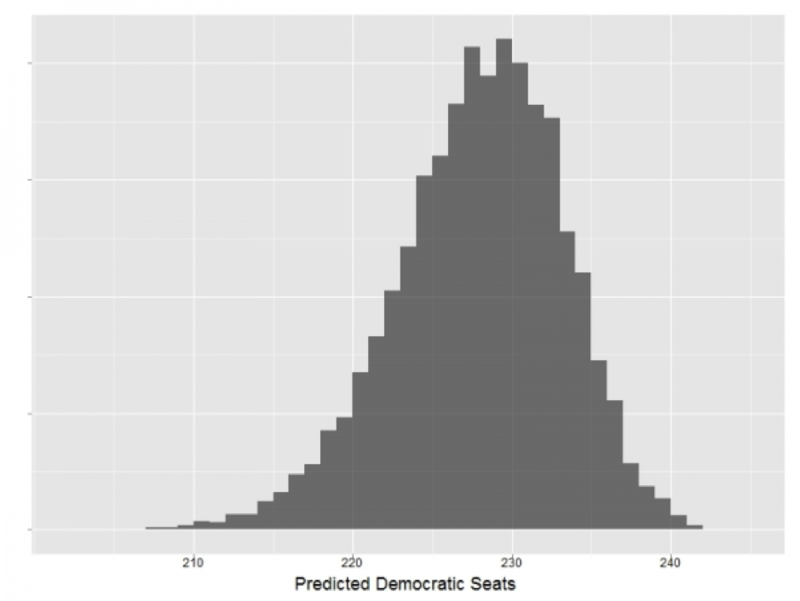 So for now the model stands practically alone in predicting that the Democrats might be able to hold the House, and suggests that the media, professional prognosticators, and poll-driven predictions might all be missing something. What could this be? Professor Gordon has also made the point that forecasts of the 2010 elections are beginning to bear all the hallmarks of a bubble: More and more people say it will be a landslide because more and more people say it will be a landslide. One place this bubble could play out option is in expert prognosis; the more everyone comes to believe the election will be a landslide, the more prognosticators may be tempted to move individual races more in a Republican direction. Another way it could pop up could be in dealing with likely voters. The trick to getting polls to accurately predict elections -- and especially close elections -- is to get the relationship between registered voters and likely voters right. It’s certainly worth asking whether pollsters could be tweaking their likely voter models to get the results where the "bubble" mentality says it should be. Or, to put this another way, it would not be surprising if there are more pollsters worrying about whether there are problems with their likely voter models when they see unexpected Democratic strength than when they see unexpected Republican strength. There are also lingering concerns about cellphone-only users and whether the use of landline-only surveys are overstating the likely vote for Republican candidates, especially in congressional districts with small numbers of polls. None of these points alone are probably enough to challenge the conventional wisdom, but taken alongside the behavior of donors -- who really do have their money at stake -- then perhaps there are a few more reasons to think the poll-based predictions might be running a bit pro-Republican? Adam Bonica is a post-doctoral fellow at the Center for the Study of Democratic Politics at Princeton University. Joshua A. Tucker is associate professor of politics at New York University, a National Security Fellow at the Truman National Security Project, and a co-author of the political science and policy blog The Monkey Cage.